, a celebrated grammarian in the time of Pompey, was of Amisa in the kingdom of Pontus, and was a disciple of Dionysius of Thrace, at Rhodes. In the year 70 B. C. he fell into the hands of Lucullus, when that general of the Roman army defeated Mithridates, and seized his dominions; but his captivity was no disadvantage to him, since it procured him.an opportunity of becoming illustrious at Rome, and raising a fortune. This he partly expended in collecting a library of above 30,000 volumes; and it is probably owing to his care in collecting books that the writings of Aristotle have not perished together with innumerable other monuments of antiquity. 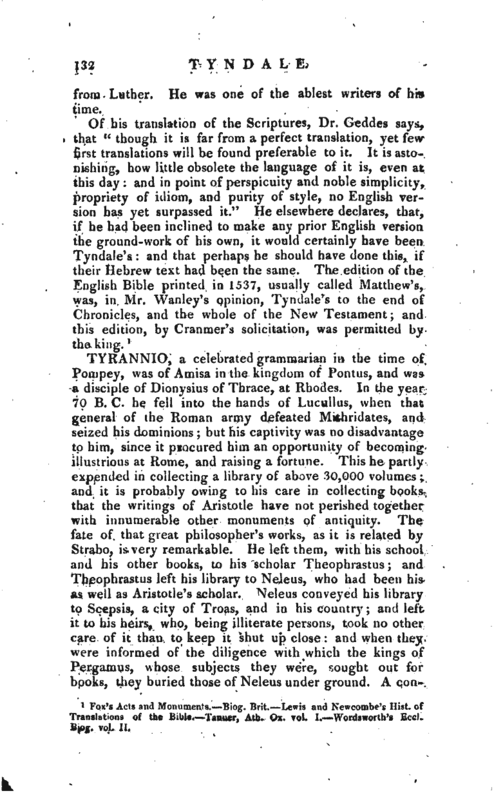 The fate of that great philosopher’s works, as it is related by Strabo, is very remarkable. He left them, with his school and his other books, to his scholar Theophrastus; and Theophrastus left his library to Neleus, who had been his as well as Aristotle’s scholar. Neleus conveyed his library to Scepsis, a city of Troas, and in his country; and left it to his heirs, who, being illiterate persons, took no other care of it than to keep it shut up close: and when they were informed of the diligence with which the kings of Pergamus, whose subjects they were, sought out for books, they buried those of Neleus under ground. A | considerable time after, their descendants took them out of their prison, much damaged, and sold those of Aristotle and Theophrastus to one Apellicon, who caused them to be copied, but with an infinite number of errors. 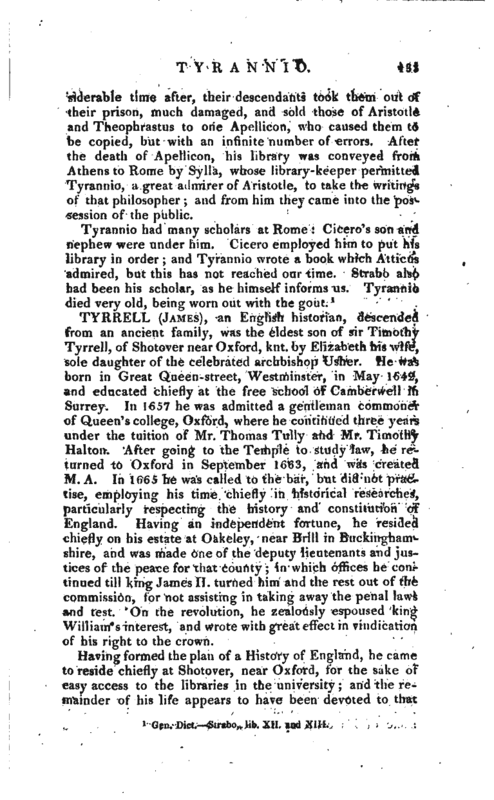 After the death of Apellicon, his library was conveyed from Athens to Rome by Sylla, whose library-keeper permitted Tyrannio, a great admirer of Aristotle, to take the writings of that philosopher; and from him they came into the possession of the public. Gen. Dict. Strabo, lib. XII. and XIII.